On July 30th, Major William Richardson Davie and his North Carolina Patriot force ambushed three companies of Col. Samuel Bryan's North Carolina Royalists. The ambush was located within sight of the strong British post at Hanging Rock. Most of the Loyalists were killed or wounded. After capturing all of the weapons and horses of the Loyalists, Major Davie withdrew with his force. The British garrison at Hanging Rock was too startled by the sudden attack to intervene on behalf of the Loyalists. On July 30th, while Col. Thomas Sumter was attacking Rocky Mount, Major William Richardson Davie made a spectacular diversionary attack on Hanging Rock, some fifteen miles to the east of Rocky Mount. Major Davie had 40 dragoons and a similar number of mounted riflemen, far too small a force for any serious attack on the 500 or so manning the British outpost. However, in reconnoitering the enemy's camp, Major Davie discovered that three companies of Loyalist mounted infantry were bivouacked at a house within plain view of the main encampment. No record of their number has been found and a company strength in those days varied widely. Major Davie's mounted riflemen, who came from the same background as the Loyalists, were dressed roughly the same, so he sent them casually toward the house. They rode unchallenged past the Loyalist sentinels, dismounted in a lane near the buildings, and opened fire. The Loyalists fled toward the other end of the lane, but Major Davie had sent his dragoons on a circular path through the woods in anticipation. Cut off at both ends, the Loyalists tried the middle, but Major Davie also predicted that move and sent a small number of dragoons to close that escape route. The Loyalists were cut to pieces within sight of their companions in the main camp. Before relief could be organized, Major Davie's troops remounted and withdrew from the scene. Loyalist casualties are not recorded. Major Davie did not lose a man. Outnumbered two to one, American Patriots, under the command of Major William Richardson Davie (NC) and Col. Thomas Sumter managed to overrun and almost annihilate a British Provincial regiment and took most of its supplies at the battle of Hanging Rock. But events leading to the Hanging Rock skirmish actually began on July 30, 1780. That day, Col. Thomas Sumter split his forces into two groups. He led one to Rocky Mount, while Major Davie led his NC Patriots to Hanging Rock as a diversion. Major Davie and his troops were dispatched to raid a British outpost near a spot where Stevens Spring Fish Hatchery is now located south of Heath Springs. With the element of surprise on Major Davie's side, the raid was quite successful and many arms were captured. Meanwhile, Col. Thomas Sumter, his South Carolina Militia, and a Catawba Indian party set about a raid at Rocky Mount, south of present-day Great Falls. Col. Sumter's group tried to attack several log cabins used by British troops by setting the roofs on fire, but the raid was unsuccessful because a thunderstorm put the fires out. Col. Sumter and Major Davie then met again at Lands Ford. On August 5, the Wading Rock - a directional marker the Catawbas had taught to the settlers - was visible in the Catawba River shoals. With the water down, the 600 Patriot soldiers made plans to attack British soldiers again at Hanging Rock. They marched to the encampment about two miles south of Heath Springs near the battle site along Hanging Rock Creek. The British troops were surprised and overrun in about four hours. Many did not survive and losses were estimated at 350 men. Others were wounded, captured and taken prisoner. The Americans were successful in making the British abandon the Hanging Rock outpost and took many supplies, but it's seen as an indecisive victory because Sumter, Davie, and their men withdrew. The name Hanging Rock is somewhat misleading. The large boulder doesn't hang, it is firmly planted and is more accurately described as an overhang formed as though a triangular slice had been taken out of the bottom leaving a peaked roof above. The opening is large enough to shelter over 50 men from the elements. Around this landmark, Provincial Major John Carden established his camp. 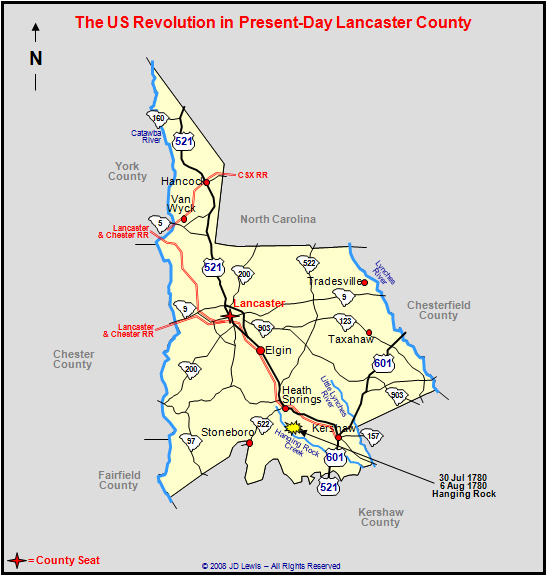 The garrison, about 500 strong, consisted of 160 men from Lt. Col. Banastre Tarleton's Legion, although he was not present. Col. Thomas Brownes regiment was also there - both camped at the center of the line, in and around some houses. The Prince of Wales Regiment (Provincials) secured the right side. The left side, separated from the center by some trees, was held by North Carolina Loyalists. Part of this unit had been cut to pieces by Major William Richardson Davie a week earlier. The entire front of the camp was covered by an excellent natural defense - a deep ravine and creek. Col. Thomas Sumter, frustrated from the skirmish at Rocky Mount a week earlier, had decided that he wanted to re-hit this place, now that he learned how it was defended from Major Davie. He halted his men around midnight on August 5th within two miles of the enemy camp and began marching his men at daylight the next morning. His command was divided into three columns, each planning to attack the corresponding enemy unit on the left, center, and right. However, in avoiding enemy pickets, the guides became confused and the entire command struck the Loyalists on the left side of the camp. These immediately broke and ran to the center, hotly pursued by Patriots. The Legion infantry and some of Col. Brown's men tried to make a stand, but they were over-run and soon joined the fleeing Loyalists. Other companies of Col. Brown's regiment took advantage of the trees between the center and the Loyalist camp and worked around to the flank of the Patriots and offered deadly fire. The Patriot riflemen concentrated on officers and within minutes none were left to give any orders. By this time, many of the Provincials had also fallen and the remainder, being offered quarter, surrendered. The Provincials on the right, supported by two field pieces, formed a square. Col. Sumter's men were out of range and refused to cross into a possible line of fire. Moreso, most were almost out of ammunition, and some were already looting the British camp. Col. Sumter decided to let well enough alone. He gave orders to loot the camps of anything needed, take paroles of the officers, and to prepare litters for the wounded. Under the watchful eyes of the squared Provincials, Col. Sumter's men began a leisurely retreat. Col. Sumter reported 20 dead, 40 wounded, and 10 missing. He estimated that the enemy had at least 130 killed and a proportionate number wounded, and he had captured 73. Lyman C. Draper wrote, "Cornwallis was heard to say that no battle fell heavier on the British, condsidering the numbers engaged, the battle of Bunker Hill excepted." The Prince of Wales Regiment was no longer considered an effective fighting force, having been virtually wiped out. The British Legion had sixty-two of their men killed and wounded. Many of the Loyalists militia simply fled from the field. The British prisoners and wounded were taken to Charlotte to keep them out of striking distance of the British Regulars. The badly-wounded Major John McClure was also taken to Charlotte, where he died two weeks later. Major William Richardson Davie later wrote that his corps, "suffered much while tying their horses under a heavy fire from the Tories." He vowed he would never serve under Col. Thomas Sumter again.